After an average 22-16 record the past couple of years, the Texas Longhorns are ready to switch things up. The Longhorns will make a transition back into a spread offense next season, one that has been compared to the crazy, up-tempo attack at Oregon. But, will it turn the Longhorns, who will have 19 starters back next year, back into a national title contender or hold them back? David Ash showed significant improvement in his sophomore year and looked pretty comfortable in this new offense in the spring scrimmage. The goal of this new offense is too keep opponents on their heels and run enough plays to eventually tire out the defense. Even if Ash improves mightily in the passing game Texas shouldn't stray far from their ground game that carried them through much of last season. They will have speedy back Johnathan Gray back to run wild in this offense engineered by Major Applewhite. The offense should also free up other speedy players not named Gray such as explosive Daje Johnson. This speed means a lot more points and a lot more successful possessions for a team that struggled constantly on offense last season. The key though, as usual, hinges on the quarterback position with Ash. Although Ash is not known for his scrambling ability, as most spread quarterbacks are, he can break a few when give some open space. If he be a factor on the ground it could take the pressure off Gray, who will be a workhorse this next year. The scariest player in this new offense? 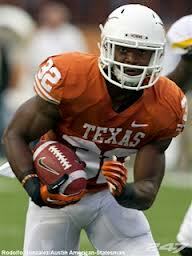 Tyrone Swoopes, the explosive freshman who could replace the terrible Case McCoy as backup to Ash. Swoopes showed great promise in the team's spring scrimmage, and the coaching staff has a ton of confidence in him. Ash will be the starter, unless he gets struck by an injury, but Applewhite should be creative in getting Swoopes the ball. Although Swoopes is a quarterback he also could be used in some time of screens and in Wildcat-like formations. The talent on this Texas roster favors this new look offense. With players like Swoopes, Gray, Johnson and Mike Davis running wild this could be a truly magical year for these Longhorns. 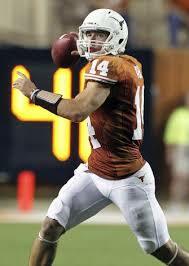 To see a full preview of Texas' 2013 season, view my College Football Preview 2013-2014 coming out this spring.